Daily Art Card made on March 20th and named “Weave your way there”. I was inspired by Diana’s great tutorial Handwoven Greeting Card for this one. Big thank you to Sis’ D for the inspiration. I ♥ tutorials! I did this card when watching Antikrundan on television, though some cards this month I’ve made while laying in bed, cutting and gluing before going to sleep. It’s not ideal, but it works. Materials: Black thread, wool and mohair yarn on 10x10cm watercolor paper. 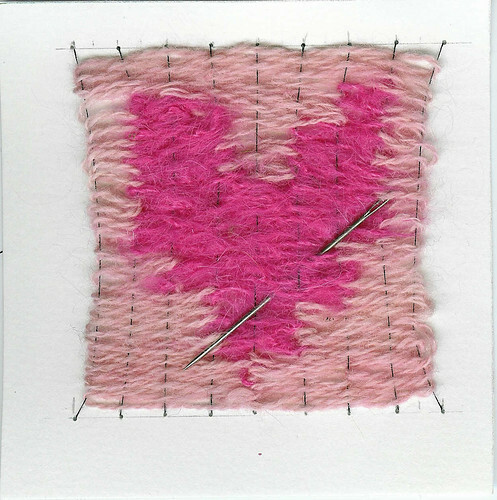 This entry was posted in A Creative Life, Art Experiments and tagged daily art card 2008, daily creating, hearts, weaving, yarn. Bookmark the permalink. That is soooo pretty! It never ceases to amaze me the things you create… and their beauty!! Oh, This look’s like fun! Did you see the felted animal’s at the Helping Amelia blog entry I made? I found them afterwards on Katherine Dunns site. Check out her paintings and blog when you get a chance. You’ll probably have to click home when you click that link, if you want to check out her blog.I just put a link up to the felted animals. She is on my list also. I put up a link to your flickr photos of the feathers and your blog in the Easter greeting. the Thrusday before Easter was Holy Thrusday. Just below the Easter blog entry I put up a Sark Journal I bought at Goodwill. Wow…that.is.COOL. I need to try that. Det var en rigtig sjov ide! OOH! Awesome! I love how you wove in the heart image. One of my favorite parts of making tutorials is, frankly, seeing what you do with them – you always take the project in a beautiful new direction.